Sick of training hard, trying to eat healthy and still not losing weight? The Isagenix Shake and Cleanse Pak is for you! The Isagenix Shake and Cleanse Pak is a safe way to lose weight and boost your health. This is a lifestyle composed of giving your body the proper nutrition it needs to perform. 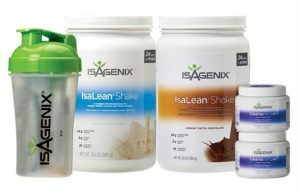 It contains the two most popular Isagenix products; IsaLean meal replacement shakes, and Cleanse for Life (aloe vera based cleansing drink). Australian orders will be shipped fast from either Perth or Sydney (depending on your location). International orders will be shipped from the distribution centre in your country (e.g from Auckland for New Zealand orders). The Isagenix Shake and Cleanse Pak will rev up your metabolism and help the organs that are key to bodily cleansing. This will efficiently help process and dispel waste (and weight loss is a by-product of this). In the Isagenix Shake and Cleanse Pack you will receive two canisters of IsaLean Shakes that come in flavours Creamy Dutch Chocolate, Creamy Vanilla or Strawberry Cream. Each shake includes 24 grams of protein, vital nutrients and active enzymes. You will also receive two tubs of Isagenix Cleanse for Life, a vital component of the Isagenix nutritional cleansing process. This is a great pack for those who agree nourishing your body is vital for powering through the day. How Can You Buy the Shake and Cleanse Pack? The great thing about network marketing is that it is one of the fastest growing industries in the world and backed by popular entrepreneurs such as Robert Kiyosaki and Bill Gates.